If your main squeeze is a bit of a foodie (or even if they aren’t), then Otto’s is your one-stop-shop when Cupid comes a-knocking. Pull your loved one close and get ready to indulge in some truly unforgettable and delicious memories, all thanks to Otto’s seasonal, romantic, lust-worthy offerings of tasty love. 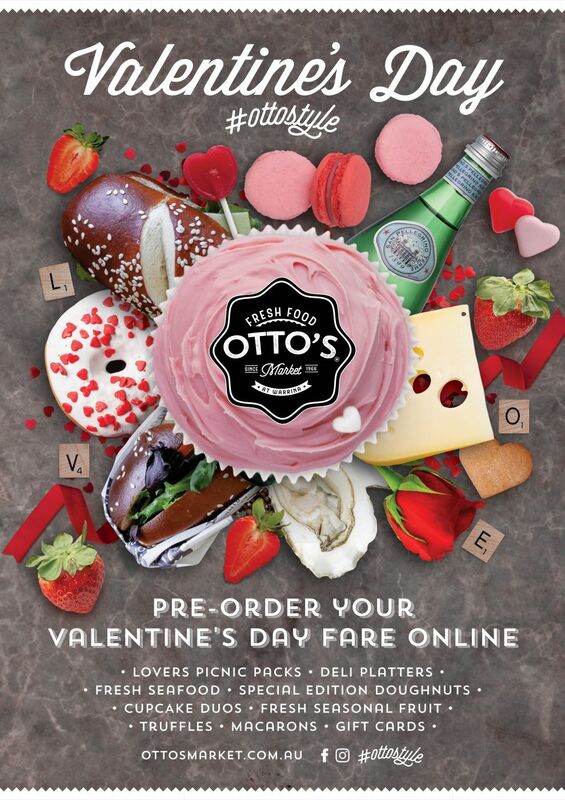 Whether you choose to live the sweet life with an extravagant doughnut hamper, have a night in with a Valentine’s edition deli platter, or surprise your loved one with a ready-to-go picnic pack, Otto knows how to tug at the heart strings. Our Valentine’s Day pre-order collection is online now so you if you like to keep your finger on the pulse, you can snap your goods up quickly and avoid disappointment. We will be taking online orders until 7pm on Tuesday, February 12. But, if you’re a little more on the modest side (or simply forget to order ahead), you can visit us in store on the day for your choice of a stunning selection of chocolates, cupcake duos and other delicious treats…. but stock will be limited! Oh, the way to our hearts this year is with food!